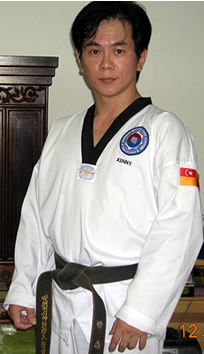 Shihan Kenneth Tang holds a 6th degree black-belt in Taekwondo and is currently Head Instructor of the Koguryo Taekwondo Academy (located in Klang, Selangor, Malaysia) as well the President of the Selangor Moodukkwan Sport Taekwondo Association and the Deputy President of the Malaysia Moodukkwan Sport Taekwondo Association. Coach Tang is also a Certified Neuro-Linguistic Programming (NLP) Practitioner and a Certified Life Coach. He has been actively involved in Taekwondo for the past 30 years — 20 as an instructor, 10 of which as the state Taekwondo Head Coach (retired in 2003) of his home state, working for the State Athletic Commission. His work involved training the state’s Taekwondo squad specifically for the biennial multi-sport Malaysian Games, and for the Malaysian National Team. He has also been privileged to train athletes for regional and international meets. Shihan Tang started Taekwondo training in 1978 and received his 1st degree black-belt in 1982, after which he started to assist in teaching beginners’ classes. He began to be actively involved in competitive Taekwondo as a coach in 1988 and has been training athletes and leading teams for competitions and tournaments every year, non-stop, ever since. Currently, he conducts three different types of training programs: 1. Traditional Taekwondo, 2. Personal-defense training, and 3. Olympic-style Taekwondo (both on team-consulting as well as personal-training basis). Shihan Tang is still training under and working with Grandmaster C.K. Leow (8th Degree, Moo Duk Kwan and Kukkiwon) who was a direct student of the late General Choi Hong-Hi and has been the prime moving force in Malaysian Taekwondo for the past 40 years and is still actively involved as the Vice-President of the Malaysian Taekwondo Federation as well as the Head Instructor and Technical Director of the Malaysian affiliate of Taekwondo Moo Duk Kwan, Korea. Previously, Grandmaster Leow was also the Secretary-General of the Asian Taekwondo Union as well as the South East Asian Taekwondo Union. Shihan Tang holds a Level 3 Sports Science accreditation in the Malaysian National Coaching Accreditation Scheme (N.C.A.S.) and is also a certified Remedial and Sports Massage therapist and has worked with athletes in this capacity at the national, regional and international levels. Shihan Tang is an avid reader. His reading interests range from Ayn Rand all the way to Zen Buddhism. In addition to martial arts, he maintains a keen interest in philosophy, history, Zen, Taoism, Confucianism and new business and technological innovations. He also regularly engages in ideas-exchange, discussions and cross-trainings with senior instructors/coaches from other disciplines such as Aikido, Goju-ryu Karate, Silat Gayong, etc. In 2003, after retiring as Head Coach from the Athletic Commission, Shihan Tang started a retail gifts business with his wife and their business now has three outlets. In February of this year (2008), Shihan Tang was blessed with the proudest moment of his entire life: he became the father of a beautiful 7½ lb baby-boy. The Institute is confident that the association of Shihan Tang will be fruitful both for The Institute as well as all the students. We look forward to a successful collaboration together.